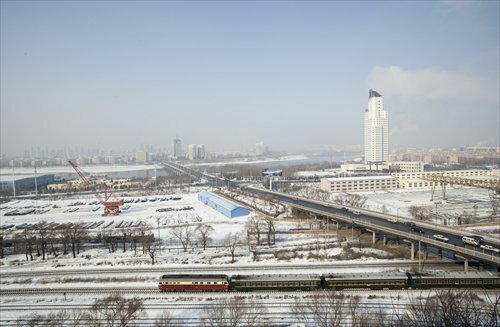 The three provinces in Northeast China - Heilongjiang, Jilin and Liaoning - are mired in severe financial difficulties, with tax revenues having fallen in more than 70 percent of Heilongjiang and Liaoning's key industries this year, a domestic media report said Thursday. Experts noted that enterprises in the three provinces should launch industrial upgrading efforts, including measures such as increasing research and development. According to a report by Beijing-based Economic Information Daily on Thursday, only four of the 16 key industries in Heilongjiang saw an increase in tax revenues in the first three quarters. The situation was no better in Liaoning. Apart from a few industries such as refined oil, most industries in Liaoning also saw a slide in tax revenues in the first three quarters, the report said, and the local real estate sector has seen its tax revenues fall for 21 months. The Economic Information Daily also cited a local tax bureau official in one of the three provinces as saying that they had great difficulties in collecting taxes this year, a problem they had never experienced before. "Production has come to a standstill in many local factories and employees no longer go to work. All those companies have bad debts," the official was quoted as saying. Local government revenues have also slumped in the three provinces. According to data released by the Liaoning Province Finance Department on November 11, Liaoning's general public budget revenues fell about 31 percent year-on-year in the first 10 months of 2015. In the first half of this year, Heilongjiang and Jilin's general public budget revenues also slumped by 20.1 percent and 3.1 percent year-on-year, respectively, the Economic Information Daily reported. Meanwhile, Heilongjiang, Liaoning and Jilin saw GDP growth of 5.5 percent, 2.7 percent and 6.3 percent, respectively, in the first three quarters this year. Dong Dengxin, director of the Finance and Securities Institute at Wuhan University of Science and Technology, told the Global Times on Thursday that the three provinces have always been heavily reliant upon heavy industries such as auto manufacturing, coal and oil. However, as the industrial sector has declined amid overcapacity problems in recent years, the region's economy has been hard hit, Dong said. For example, China FAW Group Corp (FAW), an automobile manufacturer based in Changchun, capital of Jilin Province, saw its sales slump by about 11.3 percent year-on-year in the first six months this year, the Beijing-based China Youth Daily reported on July 16. A former FAW employee, who wished to remain anonymous, told the Global Times on Thursday that FAW's sales had been good before 2014, but they have fallen back in the last two years. "First, demand has been shrinking. Second, competition has intensified, both from domestic companies and from overseas brands like Ford," he noted. Another industrial giant, coal manufacturer Heilongjiang Longmei Mining Holding Group Co, which is also the largest State-owned enterprise in Heilongjiang, made losses of nearly 6 billion yuan ($938 million) in 2014, up from 2.3 billion yuan in 2013, according to the Economic Information Daily. The Xinhua News Agency also reported on June 13 that Longmei had made a loss of more than 2 billion yuan in the first five months in 2015. According to a report by Beijing-based finance news website caixin.com on September 23, Longmei announced plans on September 21 to "transfer" 100,000 employees before the end of this year, which could indicate that layoffs are coming. But Dong said that dismissing employees is a "passive" way of coping with financial difficulties, adding that it would be better for these industries to conduct industrial upgrading through measures such as increasing research and development. The former FAW employee said that in some industries, it's not that easy for Chinese enterprises to conduct innovation, and that it might be better for them to cooperate with overseas companies and learn from their technologies in order to spur local innovation. The former employee also noted that the investment environment in Northeast China is generally worse than in other Chinese provinces, for reasons such as the cold weather and undesirable infrastructure. Therefore, it's very hard to attract investors from sectors such as the services industry to the region. Dong said that upgrading would not mean that Northeast China would have to abandon its industrial traditions. "Although many industrial enterprises have reached a bottleneck, I would still suggest that the government should enlarge and strengthen the industrial sector in Northeast China," he noted.